Question: What is communication? Explain the process of communication with it's diagram. Communication can best be summarized as the transmission of a message from a sender to a receiver in an understandable manner. The importance of effective communication is immeasurable in the world of business and in personal life. From a business perspective, effective communication is an absolute must, because it commonly accounts for the difference between success and failure or profit and loss. It has become clear that effective business communication is critical to the successful operation of modern enterprise. Every business person needs to understand the fundamentals of effective communication. Communication starts with the sender, who is the initiator of the message. After generating an idea, the sender encodes it in a way that can be comprehended by the receiver. Encoding refers to the process by which the sender translates his thoughts into a series of verbal and non-verbal actions that he feels will communicate the message to the intended receiver. For example, translating the thought into any language. The information that the sender wants to communicate is transmitted over a channel through which the message travels to the receiver. A channel connects the sender to the receiver. Channels for communication may include a memorandum, a computer, a telephone, a telegram, or a television. The choice of a channel depends on the communication situation. For instance, when dealing with confidential information, direct face-to-face interaction or a sealed letter are more effective channels than a telephone conversation. Noise is anything that has a disturbing influence on the message. Since noise hinders communication, the sender should choose a channel that is free from noise. Noise may occur at the sender’s end, during transmission, or at the receiver’s end. The receiver is the person to whom the message is transmitted. In order to decode the message, the receiver has to be ready to receive the message. That is. the receiver should not be preoccupied with other thoughts that might cause him to pay insufficient attention to the message. Decoding refers to the process of translation of symbols encoded by the sender into ideas that can be understood. Communication can be considered effective only when both the sender and the receiver attach similar meanings to the symbols that compose the message. For example, a message in technical jargon requires a recipient who understands such terms. Communication is not complete unless it is understood by both the sender and the receiver. A message generated by the receiver in response to the sender’s original message is known as feedback. Feedback is necessary to ensure that the message has been effectively encoded, transmitted, decoded and understood. It helps a sender evaluate the effectiveness of his message, so that he can modify his subsequent messages. Feedback also confirms whether there has been any change in the behavior of the individual or in the organization as a result of communication. 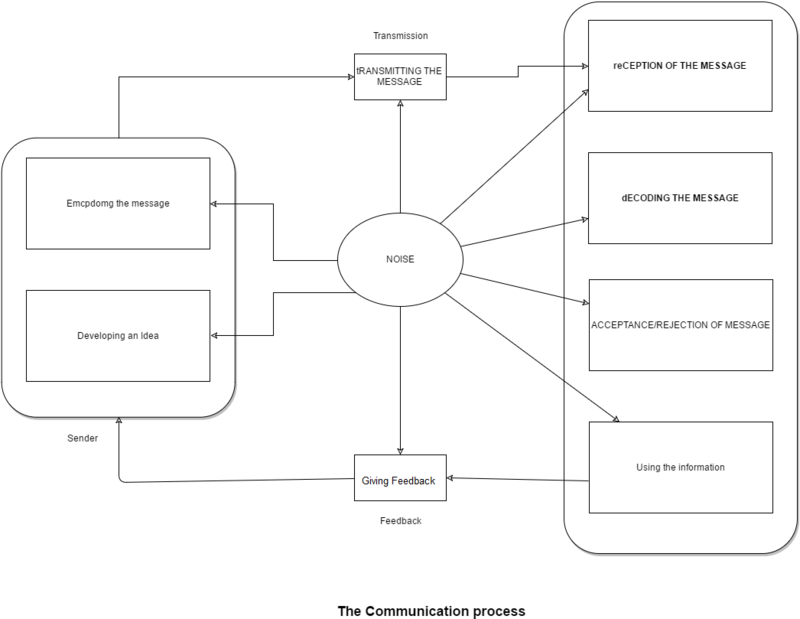 The communication model discussed above provides the basic framework of the communication process, identifies the key elements (sender, transmission, receiver, noise and feedback), and shows their relationships. This framework helps managers pinpoint communication.